This is a 9 mn film that i supervised on the Palestinian workers going through Bethleem checkpoint everyday, from 4 am onwards. 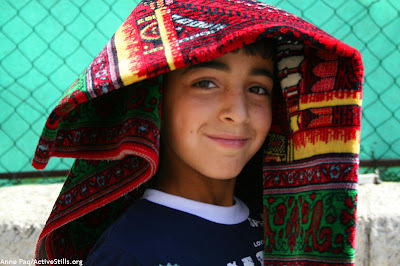 It was filmed by a Palestinian team from AlRowwad projects' Images for Life (www.imagesforlifeonline.com). Expansion continue de la colonie de Har Homa/ Continuous expansion of Har Homa settlement. Hier des photographies de la destruction d'une maison palestinienne dans la vieille ville de Jerusalem... aujourd'hui des photos de la construction de nouvelles habitations dans la colonie de Har Homa; pres de Bethleem. voila ce qui se passe sur le terrain. Yesterday some photographs of the destruction of a Palestinian house in the Old city of Jerusalem...today some photographs of the construction of new housing in Har Homa settlement, near Bethlehem. this is what is happening on the ground. 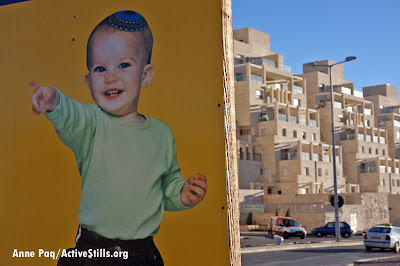 Har Homa is not in Jerusalem.Israel announced a plan last week to build 307 new housing units in what most international media are calling "a Jewish neighborhood of East Jerusalem. 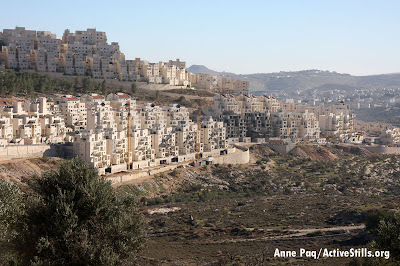 "Har Homa's white apartment blocs are draped on a hillside overlooking the city of Bethlehem, where I work. Like other West Bank settlements, it was erected on high ground, with the intention of intimidating the Palestinian population below. Spatially speaking, Har Homa is no more in Jerusalem than Bethehem itself is.The ongoing expansion of Har Homa has been evident to Palestinians in Bethlehem long before it aroused the "concern" of officials in Washington and Brussels. Every day the cranes swivel and the bulldozers move the earth, all in plain view on the adjacent hillside. 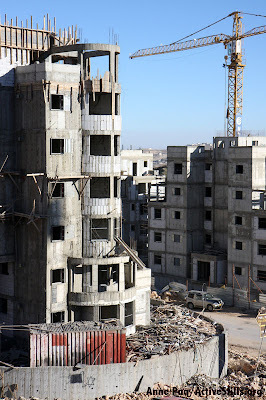 New buildings seem to materialize before our eyes.In the lived reality of Bethlehem's residents, Har Homa is an eyesore, a sign of the weakness of the international system and of the collapse of past peace talks. It disfigures the landscape and serves as a perpetual representation of defeat. Har Homa's Israeli residents are a mystery. Physically they are our neighbors, but due to the segregation of Israelis and Palestinians, they might as well live on Neptune.Calling Har Homa a "Jewish neighborhood of East Jerusalem" gives the reader the sense that the settlement is somehow a natural, historic, and integral part of the city of Jerusalem. This is a fantasy.Har Homa was first constructed amid international outcry in 1997. It is built within the artificially-expanded municipal boundaries of Jerusalem. After Israel occupied the West Bank, Gaza Strip, and East Jerusalem in June 1967, it enlarged these boundaries. Just two weeks after the end of the war, the borders of East Jerusalem bulged to ten times its pre-occupation size, so that they now abut the towns of Bethlehem to the south and Ramallah to the north.The United Nations recognizes East Jerusalem as occupied territory, and therefore rejects Israeli sovereignty over the area. In response to the expansion of Jerusalem's borders, the United Nations Security Council ruled the move "invalid" in resolution 252 of 1968.In July 1980 the Israeli government reaffirmed its de facto annexation of this area through the enactment of the Basic Law on Jerusalem. In August 1980 the Security Council, in Resolution 478, declared that "all legislative and administrative measures taken by Israel, the occupying power, which have altered or purport to alter the character and status of the Holy City of Jerusalem, and, in particular, the recent 'Basic Law' on Jerusalem, are null and void and must be rescinded forthwith. "Official United States policy also does not recognize Israeli authority in East Jerusalem. In the 1991 Letter of Assurances to the Palestinians, part of the official record of the Madrid Peace Conference, the United States said, "We do not recognize Israel's annexation of East Jerusalem or the extension of its municipal boundaries. "Israel's strategy, then, has been to use the construction of settlements to shape political space. The aim has always been to establish "facts on the ground" that would supplant and defy international norms of what is just and legal. Violence, not spatial reality, is what made the area known to Palestinians as Jebel Abu Ghneim, now Har Homa, "part of East Jerusalem. "The violence of Israel's establishment and its subsequent conquests will have inevitably shaped any future Palestinian state. Replacing violence with justice is not possible under the present circumstances, but it is nonetheless important to insist on the illegality of settlements like Har Homa. Ultimately, in a possible two-state resolution to the conflict, it is the "mainstream" settler communities around Jerusalem that will become the most difficult. Israelis know that the militant outposts deep in the West Bank must be dismantled, but this understanding is not the case with the larger, more entrenched colonies along the western "seam zone. "The use of concrete buildings, as much as the use of terminology, to shape the hegemonic conception of where Israel's boundaries in fact lie, is crucial here. If the 1967 borders, even in their arbitrariness, are to be the terms of reference, let us be relentless in our insistence on them. U.S. Secretary of State Condoleezza Rice demanded explanations from her Israeli counterpart, Tzipi Livni, last week about the plan to build another 300 apartments in the Har Homa neighborhood of East Jerusalem. Rice did not make do with posing a question to Livni; she hastened to go public with the Bush Administration's objections to the plan. Administration spokespeople normally oppose any moves liable to damage Israeli-Palestinian final-status negotiations - namely, the settlements. But this time, Rice also expressed fear that the construction in Har Homa would disrupt the Annapolis process. Prime Minister Ehud Olmert and Palestinian President Mahmoud Abbas claim to be racing toward George W. Bush's goal - concluding the negotiations and establishing a Palestinian state within a year - but the talks are still at the takeoff stage, and the presumption that the process is going quickly is threatening to crash into Har Homa. Israel has no good answer to the American objections. An internal matter? Har Homa is within Jerusalem's municipal boundaries and under Israeli sovereignty? A bureaucratic issue? An Israel Lands Administration tender whose turn had come to be published? These claims are ridiculous. No one in the world recognizes Israel's annexation of East Jerusalem. It is enough to examine the official maps published by the U.S. State Department and the CIA: Everything beyond the lines Israel held on June 4, 1967, is occupied territory. That is true for the Golan Heights, and it is true for the new neighborhoods Israel built in Jerusalem. Israel's unilateral steps are a game of make-believe that obligate nobody but itself - and especially not the world's greatest power, which is also the only country that gives Israel vital military and diplomatic assistance. Nor can Israel rely on Bush's April 2004 letter to former prime minister Ariel Sharon in which the U.S. president said the reality created by settlements in the territories must be taken into account. Bush's declaration was not a commitment to refrain from evacuating settlements, does not bind his successors and has even been demonstratively omitted from other diplomatic documents, including an almost identical letter he sent at the same time to King Abdullah of Jordan. In any case, anything that has happened in the three and a half years since then is surely not covered by the Bush declaration. It is no surprise that Israel's move has been interpreted as a provocation, or at best stupidity, coming as it does on the threshold of a fateful diplomatic breakthrough that Israel is ostensibly happy to participate in, not one it has been dragged to. The old tricks - like expanding the settlements' external boundaries, building new settlements under the guise of neighborhoods of existing settlements or, the most beloved excuse of all, "natural growth" - deceive nobody. They merely provide the Palestinians with ammunition for their propaganda, help Hamas to claim that Olmert is humiliating Abbas and push Bush and Rice into taking a stand against Israel. The Annapolis festivities have ended, and the test will be in the dull implementation. Thus far, not a single outpost has been evacuated, not the slightest diplomatic progress has been made, and Israel is retreating into the worst of all possible worlds - subject to terror attacks that the Palestinians are still not really trying to restrain, yet putting itself, with its own hands, on the diplomatic defensive. At this rate, and with this sagacity, the Annapolis conference will prove no more than a barren footnote. 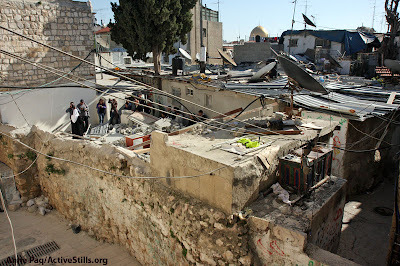 After the demolition of a Palestinian home in the old city of Jerusalem. Ce matin une maison ; dans laquelle résidait une famille palestinienne de 13 personnes a été démolie dans la vieille ville de Jérusalem. Deux jeunes hommes de la famille ont été également battus et arrêtés. C’est la huitième maison démolie dans la municipalité de Jérusalem depuis Annapolis. Les Palestiniens ne sont jamais autorisés à construire dans la vieille ville ; ils ne peuvent pas obtenir des permis de construire bien qu’ils soient propriétaires et qu’ils payent leurs impôts municipaux. 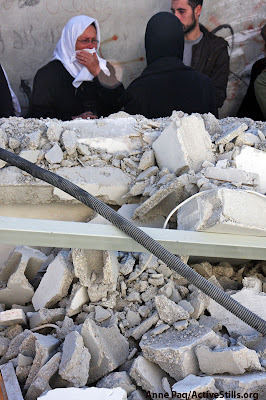 This morning a house; home of family of 13 Palestinians was demolished in the Old City of Jerusalem. Two young men of the family have been beaten and arrested. It is the 8th home to be demolished by the municipality since Annapolis. Palestinians are never allowed to build in the Old City, so they never get buildings permits, even though they own the land, and pay their municipal rates and taxes on that land. Racism against Israel's Arab citizens has dramatically increased in the past year, including a 26 percent rise in anti-Arab incidents, according to the Association for Civil Rights in Israel's annual report. Author Sami Michael, the association's president, said upon the release of the report that racism was so rife it was damaging civil liberty in Israel. "Israeli society is reaching new heights of racism that damages freedom of expression and privacy," Michael said. The publication coincides with Human Rights Week, which begins Sunday. "We are a society under supervision under a democratic regime whose institutions are being undermined and which confers a different status to residents in the center of the country and in the periphery," Michael said. The number of Jews expressing feelings of hatred toward Arabs has doubled, the report stated. According to the June 2007 Democracy Index of the Israel Democracy Institute, for example, only half the public believes that Jews and Arabs must have full equal rights. Among Jewish respondents, 55 percent support the idea that the state should encourage Arab emigration from Israel and 78 percent oppose the inclusion of Arab political parties in the government. According to a Haifa University study, 74 percent of Jewish youths in Israel think that Arabs are "unclean." The ACRI says that bills introduced in the Knesset contribute to delegitimize the country's Arab citizens, such as ones that would link the right to vote and receive state allowances to military or national service. They also include bills that require ministers and MKs to swear allegiance to a Jewish state and those that set aside 13 percent of all state lands owned by the Jewish National Fund for Jews only. "Arab citizens are frequently subject to ridicule at the airports," the report states. It says that Arab citizens "are subject to 'racial profiling' that classifies them as a security threat. The government also threatens the freedom of expression of Arab journalists by brandishing the whip of economic boycott and ending the publication of government announcements in newspapers that criticize its policy." Hadash Chairman MK Mohammad Barakeh said that the report "did not take us by surprise and neither should anyone be surprised by it. Its results are the natural consequence of a racist campaign led by political and military leaders, as well as the result of the anti-Arab racist policies implemented by consecutive governments." is this the model of state Abbas wants to propose?! i am angry today to read this news. Ghassan stands as a true example of independent Palestinian journalist, he was beaten up, as well as demonstrators in Bethlehem and in Ramallah, and his new camera was broken. Is this the Palestinian state Abbas wants to build for the Palestinians? Bethlehem – Ma'an – More than fifty Palestinian protesters were seized violently by Palestinian security forces at a demonstration against the international meeting in Annapolis in the West Bank city of Bethlehem on Tuesday, eyewitnesses said.Witnesses said Palestinian police used water cannons and beat demonstrators with clubs and rifle butts. More than 300 Palestinians turned out in defiance of a ban on public demonstrations issued by the Fatah-dominated Palestinian Authority (PA) for the day of the conference. Demonstrators carried signs expressing opposition to the US-backed conference and demanding the right of return for Palestinian refugees.PA forces severely beat Palestinian journalist Ghassan Bannoura, breaking his camera before detaining him, witnesses said. Bannoura was later hosptialized with a broken arm and bruises on his back and legs. Bannoura said police and civilian Fatah supporters armed with clubs beat him several times and held a gun to his head, threatening to kill him. "As journalists we are afraid," said one Palestinian reporter who witnessed the brutality, "We could not even open our cameras … I felt today like I was in Gaza." He was referring to the Hamas-run Gaza Strip, where several high-profile demonstrations have been suppressed by security forces. "What we saw today was fascist," said the reporter, who asked not to have his identity revealed. What do you mean when you say 'no'? By Gideon LevyA festive day for peace: Israel is planning to announce a freeze on construction in the settlements as compensation for refusing to discuss the core issues. The Palestinians are ecstatic at all the good-will gestures Israel is throwing their way. First came the release of prisoners, now a freeze on construction, and the prime minister has already spoken with the settler leaders and informed them of the decision. They said it was a "difficult meeting," as it always is, winking at each other deviously. Undoubtedly, Israel wants peace. But a tiny detail seems to have been forgotten: Israel has signed a series of binding agreements to freeze settlement activity, which it never intended to fulfill. Of the 40 years of occupation, only during three has construction been stopped despite all the agreements and promises to do so. There is no reason to believe that Israel will behave differently this time. Of all Israel's iniquities in the occupied territories - the brutality, the assassinations, the siege, the hunger, the blackouts, the checkpoints and the mass arrests - nothing serves as witness to its real intentions than the settlements. Certainly for the future. Every home built in the territories, every light pole and every road are like a thousand witnesses: Israel does not want peace; Israel wants occupation. Whoever is serious about peace and a Palestinian state does not put up even a shed. From Oslo through Camp David and on to the road map, Israel has not put an end to the most criminal enterprise in its history. A short memory refresher: In article 7 of the Oslo Accords, Israel promised that "no party would undertake unilateral steps to alter the situation on the ground, prior to the completion of negotiations for the final status." That really made an impression on Israel. During the 10 years that followed, the number of settlers doubled. What about the heroic peace efforts of Ehud Barak as prime minister? 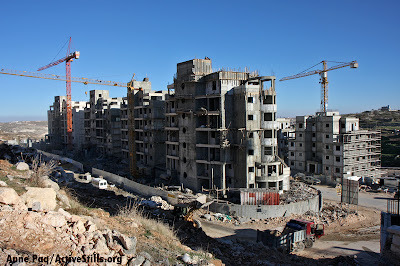 During the 18 months of his government, Israel began the construction of 6,045 residential units in the territories. And why did Israel sign up to the road map two years later? "The government of Israel will freeze all its settlement activities, in accordance with the Mitchell report, except for natural growth in the settlements." And what happened in practice? Accusations that the Palestinians are not implementing the agreements, and a boatload of new settlers. This was also the case in 2005, another major "year of peace": the disengagement. And what did Israel do in its own backyard? Another 12,000 new settlers. This terrible enterprise, whose purpose is to foil any chance for peace, is also a criminal enterprise. 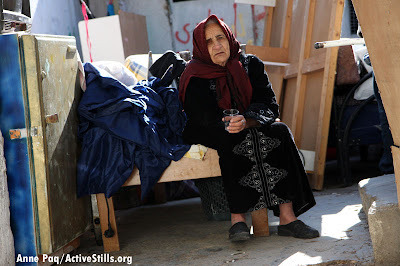 According to Peace Now, based on Civil Administration data that have been kept hidden for years, about 40 percent of the settlements were built on privately owned land of Palestinians helpless to safeguard what is in most cases their sole property that was robbed in broad daylight by an occupying state. This took place years after the Supreme Court ruled in 1979 that it is illegal to build on private Palestinian land. Indeed, while Israel is debating whether it is a state of laws, whether the prime minister was given a discount for the house on Cremieux Street, and whether we want a powerful Supreme Court, we should remember that what is happening in the territories is the real corruption that engulfs us. 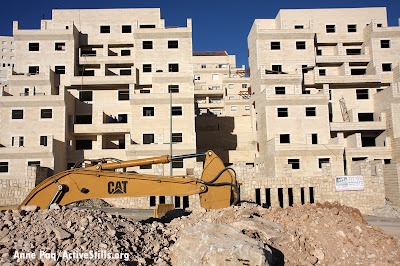 Now we are on the eve of another peace event, yet during the past year another 3,525 new residential units were built in the territories, under the auspices of a government that talks incessantly about the end of occupation and two states. All the grandiloquent statements are void of substance when we read the data: Construction is at a peak in 88 settlements. Go to the territories and see for yourselves. When the construction firm Heftsiba imploded, suddenly hundreds of new settlers came to light, further proof of the magnitude of the "frozen" enterprise. The mountains of excuses, "settlement blocs" and "natural growth," as well as "beyond the fence" and "inside the fence," cannot conceal the naked truth: The enterprise has not ceased for a moment. It will not stop now. The hands of a quarter million settlers are soiled by iniquity and felony, but they are not the true guilty party. That belongs to all Israel's governments, with the exception of Yitzhak Rabin's second government. All of them have a hand in the iniquity. Nowadays, when Ehud Olmert says no, what does he mean? Is the "no" really "no" - perhaps it is only "maybe but not right now?" In view of past experience, the bitter truth is that Olmert's "no," like all those before it, is more inviting than "yes." However, the Israeli army, like other armies, has found it difficult to maintain these values beyond the classroom. The first intifada, which began in 1987, before the wave of suicide bombings, was markedly different to the violence of the second intifada, and its main events were popular demonstrations with stone-throwing. Yishai-Karin, in an interview with Haaretz, described how her research came out of her own experience as a soldier at an army base in Rafah in the Gaza Strip. She interviewed 18 ordinary soldiers and three officers whom she had served with in Gaza. The soldiers described how the violence was encouraged by some commanders. One soldier recalled: 'After two months in Rafah, a [new] commanding officer arrived... So we do a first patrol with him. It's 6am, Rafah is under curfew, there isn't so much as a dog in the streets. Only a little boy of four playing in the sand. He is building a castle in his yard. He [the officer] suddenly starts running and we all run with him. He was from the combat engineers. 'The next day I go out with him on another patrol, and the soldiers are already starting to do the same thing." Yishai-Karin concluded that the main reason for the soldiers' violence was a lack of training. She found that the soldiers did not know what was expected of them and therefore were free to develop their own way of behaviour. The longer a unit was left in the field, the more violent it became. 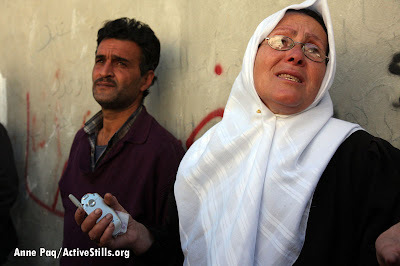 The Israeli soldiers, she concluded, had a level of violence which is universal across all nations and cultures. If they are allowed to operate in difficult circumstances, such as in Gaza and the West Bank, without training and proper supervision, the violence is bound to come out. A spokeswoman for the Israeli army said that, if a soldier deviates from the army's norms, they could be investigated by the military police or face criminal investigation. two evenings ago, i began to talk with a soldier that was unusually standing in front of the Bethlehem checkpoint. he asked me if i was in Bethlehem and how it was there, and i told him it would be so much nicer without the wall that had turned it into a prison./ of course as expected he replied that he was happy about the wall because it was the wall that was keeping him alive. i asked about the reasons why there were staying in Palestine, and told him that i do believe that with the end of occupation the security of Israel will be more secure. Typically he told me about how they left Gaza to the Palestinians and how they were still attacked. at that stage it was hard to keep calm. I told him that Gaza was not "given" back to the Palestinians, as the Israeli army still control the borders, the sea and the airspace. and that almost nobody could get in and out. this is not a really what i would call a gift. and anyway how can you give something that it not yours in the first place? I told him how Gaza had turned into the biggest prison on earth. I asked him if he knew that some people that are sick just die there because they cannot go out and get the proper treatment. last week Israel denied the entry of products that that are essential for anesthesia for surgery so now no surgery can be performed. of course he denied it all. how can the denials and lie continue? soon Gaza will turn into darkness, as the electricity is going to be cut. what is next? and when somebody will have the courage to call it- crimes against humanity? as i walked away from the soldiers, i still said goodbye. i wish that all the news as the one below will begin to be told aloud and aloud in Israel. Erez Crossing [Ma'anImages]Gaza – Ma'an – A Palestinian man suffering from a heart attack died Tuesday after Israeli forces twice refused to allow his ambulance to enter Israel where he was to be treated.A Palestinian human rights group is saying Israeli soldiers fired on the ambulance.According to the Palestinian Center for Human Rights (PCHR), Seventy-seven-year-old Nemer Mohammed Salim Shuhaiber from Gaza City was admitted to the intensive care unit at Shifa Hospital in Gaza City on Sunday suffering an acute heart attack. The Palestinian Ministry of Health ordered Shuhaiber to be transferred to an Israeli hospital for further treatment.By Monday, the Health Ministry had secured Israeli approval for the transfer. When the ambulance carrying Shuhaiber and his two sons arrived at Erez border crossing, PHCR said, Israeli soldiers fired on the vehicle, forcing it to return Gaza City.Medical officials made a second attempt to transfer the patient on Tuesday. This time, PHCR said, the ambulance was delayed for five hours at the border while Israeli soldiers inspected the ambulance. Shuhaiber, still in serious condition, was laid on the ground in direct sunlight for over an hour. At the end of the inspection, the border guards order the ambulance back to Gaza, where Shuhaiber died.Shuhaiber also reportedly suffered from diabetes and hypertension.According to PHCR, this is the fifth death in six months resulting from the obstruction of ambulances at Erez crossing. By Amos Harel and Avi Issacharoff , Haaretz CorrespondentsThere is an enormous gap between the reasons Israel is giving for the decision to impose significant sanctions against Hamas rule in the Gaza Strip, and the real intentions behind them. Defense Minister Ehud Barak authorized Thursday a plan fordisrupting electricity supply to the Gaza Strip, as well as significantly shrinking fuel shipments. This is supposed to reduce the number of Qassam rocket attacks against Sderot and the other border communities. In practice, defense officials believe that the Palestinian militants will intensify their attacks in response to the sanctions. As such, the real aim of this effort is twofold: to attempt a new form of "escalation" as a response to aggression from Gaza, before Israel embarks on a major military operation there; and to prepare the ground for a more clear-cut isolation of the Gaza Strip - limiting to an absolute minimum Israel's obligation toward the Palestinians there. Several weeks ago, Barak said Israel "is getting closer" to a major operation in the strip. Like Prime Minister Ehud Olmert and Chief of Staff Gabi Ashkenazi, Barak is not excited about this possibility. He knows that it will not be easy, and there are no guarantees for positive results. Many soldiers will be killed and so will many innocent Palestinians, because the IDF will employ a massive artillery bombardment before it sends infantry into the crowded built-up areas. This will be a "dirty war," very aggressive, that will have scenes of destruction similar to southern Lebanon in 2006. The sole exception: unlike in Lebanon, the population there has nowhere to run. Moreover, Ashkenazi has told the cabinet that he will only support an offensive operation if it is long-lasting. If after several weeks of fighting, the IDF is allowed time to carry out arrests and gather intelligence, then the chief of staff sees a point for the operation. Defense sources say the sanctions will lead the militants to intensify their attacks to show that they do not succumb to Israeli pressure. And because the sanctions will not be severe - so as not to create a humanitarian crisis - they will not be effective. It is actually expected that the gasoline shortage will have a greater effect than the disruptions in the electricity supply - which normally happens because of equipment breakdowns. The decision on sanctions is also an attempt to give expression to the inclination to completely disengage from Gaza. In this way Israel is sending a message to the Palestinian leadership in the strip that it must seek alternatives, however minor, to goods and services coming from Israel. This touches on the day after the Annapolis summit. Failure at the summit may lead Palestinian Authority Chairman Mahmoud Abbas into the arms of Hamas. In such a case, Israel is raising a big stop sign at the exit from Ramallah: Passage to Gaza is closed. Les volontaires du centre de al rowwad ont pris l’initiative d’emmener 15 gamins du camp de refugies de aida, situe a Bethlehem pour une sortie a la mer, a Jaffa. Pour la plupart c etait leur premiere sortie a la mer. Vous pouvez imaginer leur excitation durant toute la semaine. Quel plaisir de voir ces grands sourires, surtout chez des gosses difficiles. nous n'avons pu emmener que les jeunes de moins de 14 ans, au-desssus il faut une autorisation. pour une fois, pour ceux qui etaient la l'horizon etait grand ouvert devant eux, et ils pouvaient redevenir juste des enfants. The volunteers of Alrowwad center took the initiative to take 15 kids from Aida refugee camp to the sea in Jaffa. For most of them it was their first time to the sea so you can imagine all their excitement. it was such a great scene to see these kids so happy especially the ones that are the most difficult. for sure they will remember this day. unfortunatly we could not take the youth aged above 14, because they need an authorization. for once, the horizon in front of their eyes was open, and they could be children again. Cemetery in Gaza (MaanImages)Gaza – Ma'an Report – Gaza has run out of materials for the burial of its dead. Due to Israel's closure of the crossings in and out of the strip, the deceased of Gaza can no longer be buried in shrouds or graves.The remainder of cloth in the coastal region was used to make clothes for half-a-million children for Eid ul-Fitr. The cement for graves was used for purposes which were given priority over the burial of the dead.In consequence, the corpses continue to be exposed to the elements.Minister of Waqf in the de facto government in Gaza Yousif Al-Mansi said that the closure of the crossings has resulted in a humanitarian disaster. "Because of the crippling siege," said Al-Mansi, "which has been imposed on the Gaza Strip for a long time, the basic necessities for existence are absent, namely cement for graves. Even the dead are suffering from the Israeli occupation. "Al-Mansi insisted the international community exert pressure on Israel to reopen the crossings for goods, particularly cement.There are severe shortages of cement, Palestinians in Gaza reported paying 100 NIS for cement instead of 20.There is also a shortage of stones to cover the graves and Palestinians are using tinplates instead, which are fast running out.Head of the sewing union in Gaza Fuad 'Uda says there are no raw materials for making shrouds. whether or not this summit has any chance of success, it is clear that if Israel wants it to succeed it should refrain to take any action beforehand that will be seen rightly as a provocation. The last few days, we heard again about possible masssive invasion of Gaza, and now about renewing digging next to Temple Mount....the best receipe to be sure that any talks will collapse, but even more than this, it might trigger something bigger that might just backlash on Israel. a new intifada, that will start again on jerusalem. By Akiva Eldar, Haaretz CorrespondentThe Israel Antiquities Authority (IAA) is set to renew its excavations in the coming days at the Mugrabi Gate near the Western Wall in Jerusalem, which may exacerbate tensions with neighboring countries ahead of next month's planned Annapolis peace summit. The excavations, to prepare for the construction of a new bridge to the Mugrabi Gate, between the Western Wall and the Temple Mount, were stopped in June after they sparked protests from the Palestinian Authority and Arab countries. However, the Ministerial Committee on Jerusalem approved their renewal about two weeks ago. The Jordanian ambassador to Israel, Ali Ayed, asked for clarifications on Friday from the Foreign Ministry and warned that a renewal of the excavations might sabotage next month's Annapolis summit. The committee's decision was approved by ministers Avi Dichter, Rafi Eitan and Jacob Edery, over the objections of the Foreign Ministry, whose representatives told the ministerial committee Israel had pledged to several countries to prevent increased tensions around the Temple Mount. Minister of Culture, Science and Sport Ghaleb Majadele, under whose aegis the IAA falls, told the committee that renewing the work was not in keeping with the desire to promote a diplomatic process, and that the all such work should be coordinated with the Waqf, the Muslim religious trust. Haaretz has learned that the decision to renew work came after pressure on the government by the rabbi in charge of the Western Wall and the Western Wall Heritage Foundation, which is in charge of maintaining the Western Wall plaza and surroundings. Prime Minister Ehud Olmert's bureau said it saw no problem with renewing the work, and its halt in recent months reflected planning problems, and not a political decision. The IAA said conservation and documentation had been ongoing, and that excavations would be renewed when the appropriate instructions were received. The IAA began a salvage dig at the site at the beginning of the year as part of a Jerusalem municipality plan to build a new bridge for tourists from the Western Wall plaza up to the Temple Mount. In the face of opposition in Israel and abroad due to possible undermining of the foundations of the Temple Mount, and following a visit to the site by experts from Turkey, the municipality stopped the excavations and announced they would resume only after the plan was authorized as part of the city master plan. The Jerusalem Planning and Construction Council gave the green light on a program last August that was much more modest than the original. Now in the final process of approval, it takes into consideration architects' and archaeologists' concerns that the bridge could cause damage to the antiquities and obstruct the view of the Temple Mount's western and southern walls. Another objection raised was that the project would involve construction in the Southern Wall Archaeological Park, which was said to be a dangerous precedent that might spread to other such sites. The Ir Amim association demanded over the weekend in a letter to Attorney General Menachem Mazuz that he instruct the relevant bodies, including the IAA, not to reopen the dig at the Mugrabi Gate until the bridge is approved as part of the municipal master plan and receives all appropriate authorizations. Ir Amim's legal counsel, Danny Zeidman, wrote to Mazuz that the excavations were not for maintenance purposes only, but were extensive and intended to expose and remove archaeological strata from the modern and Ottoman periods. Ir Amim warned that if work was begun before authorization for the bridge was completed, it would put the legality of the construction to the test. The association said the law required reporting such work to the local planing and construction committee at least 15 days before the work started. As far as is known, such a report was not made to the authorities in Jerusalem. The United Nations Educational, Scientific and Cultural Organization (UNESCO) has listed the Mugrabi Gate as a World Heritage Site. A UNESCO source told Haaretz that in June the Foreign Ministry told the UN body that the work had been stopped except for "stabilization work." The chair of the government committee that oversees UNESCO work in Israel, Professor Mike Turner, wrote in a position paper in July that the conservation and protection of the archaeological remains from various historical and cultural periods and their integration into the archaeological park in the Western Wall plaza area must be assured; that safe access must be provided to the Mugrabi Gate in consideration of historic pathways; and that the site must be designed in an authentic manner and ensure the integrity of the site while leaving the option of an overall plan for the area from the Western Wall to the Old City walls. Turner said his statement was prepared in cooperation with the IAA. Turner also stated that Israel had to coordinate its construction at the site with UNESCO. (c) Anne Paq/activestills.org, Aida refugee camp, 12 October 2007.
c est la fete qui marque la fin du ramadan. tous les enfants prennent la rue avec leurs pistolets en plastique. this is the feast that marks the end of Ramadan. all the children take the streets with their plastic guns. la nuit de AlKader est une nuit speciale pour les mulsumans, ils restent eveilles toute la nuit. Jerusalem etait remplie de monde et d'illuminations, l'esprit etait joyeux. cela faisait plaisir a voir. autour de la porte de damas, de la musique, des jeunes fumant le narguile, des marchands...la foule s'est mise a siffler les deux soldats israeliens qui se sont faufiles rapidement. oui, pour une nuit, la nuit etait aux Palestiniens, tout du moins pour ceux qui ont pu se rendre a Jerusalem. AlKader night is a special night for the Muslims during the holy month of Ramadan. They stay up and pray all night. Everybody is out. In the old city of Jerusalem the streets were full of people and lights. there was a lot of joy around, and it is so much rare that it becomes memorable. around Damascus gate, a lot of music, sellers, narguile and food. the crowed whistled as two Israeli soldiers hastily walked through...yes for one night it was all theirs. at least for the ones that could reach Jerusalem. (c) Anne Paq/Activestills.org, Bethlehem checkpoint. Alors que d'autres Palestiniens ont pu aller a Jerusalem pour celebrer la nuit al kader, certains sont rester coinces au checkpoint de bethlehem, ferme a 19h (alors que le checkpoint reste normalement ouvert jusqu'a minuit). Ces femmes venaient de Hebron. Certains ont decide de passer la nuit au checkpoint pour aller a Jerusalem au petit matin. While other Palestinians could go to Jerusalem to celebrate Al-Kader night, many remained stuck at the checkpoint in Bethlehem that closed at 7pm (usually it closes at midnight). 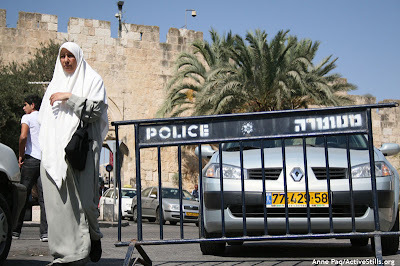 The old women on the picture came from Hebron, for nothing. Some Palestinians decided to sleep in the checkpoint in order to go to Jerusalem the next day. By Amira Hass"The protest wave has calmed down," some Israeli journalists said Friday of the Burmese military junta's success in driving thousands of demonstrators off the streets, using excessive violence. Despite the natural sympathy for the uprisers, several editors chose the word "calm," which embodies the rulers' point of view: The norm is "calm," even if it means constant government violence. The mass protest against the oppression is a disruption of order and calm. The word "calm" was an automatic reflection of how most Israeli Jews and their media see the constant, 40-year Israeli oppression of the Palestinians. This is the norm one thinks of when the Palestinians disrupt the calm. The oppression of the Palestinian people is intended to perpetuate its banishment from its land and the infringement on its rights there. But on the other side of the regime of oppression is democracy for Jews, even those who oppose the occupation. Generally, Jewish dissidents are not risking their life, livelihood, freedom or rights. However, the demonstration against the separation fence does involve certain risks - a few hours in detention, soldiers' fire, tear gas, or a blow from a gun. Therefore, each protester makes his or her own courageous decision to take part in the demonstration. Assisting the Palestinian olive harvest also requires courage, because it could end in an attack by the settlers (while the government's representatives, the soldiers, stand idly by). And yet there are dozens of anti-oppression activities that do not endanger the hundreds of devoted activists (mostly women) who take part in them. Potentially, hundreds of thousands of Jewish Israelis could have taken part in activities against the multi-faceted Israeli oppression - the apartheid laws and orders, military attacks, hidden information, economic siege, land expropriation, expanding settlements, and more. Not a hair on their head would be touched. These are people who say they support peace, with a Palestinian state beside Israel. But apparently their interpretation of participation in democracy is going to the polls once every few years, and faint protest in their living room. However, democracy also is displaying civic responsibility, by constantly supervising the political decisions and acts between elections, thus ensuring that democracy's essence has not been eroded. Those who say they support a two-state solution are ignoring the other facet of the democracy-for-Jews - the military regime that it imposes on the Palestinians. This regime creates faits accomplis all the time, foiling the last chance for a solution (i.e. full withdrawal with slight changes to the June 4, 1967 lines and establishing a Palestinian state). The Jewish citizens who enjoy their democracy are not personally harmed by its other facet. On the contrary, they gain from it - cheap land and quality housing, additional water sources, a cadre of security professionals in demand worldwide, and thriving defense industries. This is the "calm" that even self-defined peace supporters refrain from disrupting. In the Soviet empire and racist South Africa - like in today's Burma (Myanmar) - objecting to oppression involved a high personal price. Therefore, one could understand the objectors who chose not to act. In Israel, because it is a democracy for Jews, all those who sit idle, ignoring what is being done in their name, bear a heavy responsibility. Chiefs of staff, prime ministers, ministers and generals are not the only ones responsible. Anyone who theoretically objects to oppression, discrimination and expulsion, but does not actively take part in the struggle and in creating a constant popular resistance to topple the apartheid regime we have created here, is responsible. La photo gagnante et la photograohe Maram/ The winning picture and the photographer. NOUVELLES..Le groupe photo de Aida recompense dans un concours photo! Les sourires des membres du groupe photo de Aida etaient eclatants lorsqu’ils ont decouvert leurs photos sur les Murs de la prestigieuse Academie Palestinienne pour les Arts, a Ramallah. Najwa, Ibrahim, Ahmad, Manar et Maram ont participe en Juin au concours photo “Colours of my City”, organisee par la Fondation Al-Mamal de Jerusalem. Tout le groupe s’est rendu a Ramallah pour la ceremonie d’ouverture et l’annonce es resulats.. Ils ont pu ainsi decouvrir l’Academie, et pour la premiere fois leurs photos sur les murs. Avec sa photo du linge etendu sur les toits de Aida Maram du groupe photo de Images for Life a gagne le troisieme prix de la competition Elle a gagne 200 dollars qu’elle va pouvoir utiliser pour acheter une camera. Nous sommes ensuite tous alles fete les resultats dans un café afin de profiter de la belle vie nocturne de Ramallah. Pour Maram, c’etait meme la premiere fois qu’elle se rendait a Ramallah. La soiree fut magique et remplie de rires. Ce resulat encourage le groupe photo a continue et a participer a d’autres concours. Nous sommes en train de preparer une exposition photo pour fin octobre. Pour voir plus de photos, consulter le nouveau site internet: www.imagesforlifeonline.com. Si vous etes interesses pour aider le groupe photo, contactez imagesforlige@gmail.com. Nous sommes toujorus a la recherche de volontaire et d’equipements. NEWS. The photo group of Aida got an award in a photo competition! It was such a great scene to see the large smiles of the members of the photo group of Images for Life when they discovered from the first time their pictures displayed a on the walls of the new prestigious International Academy of Art Palestine, in Ramallah. Najwa, Ibrahim, Ahmad, Manar et Maram participated in June to a photo exhibition entitled “the Colours of my City”, organized by Al-Mamal Foundation. All the group went with excitement to Ramallah for the opening ceremony and the announcement of the winners. It was a great opportunity to discover the Academy and to participate to a photo exhibition. With her picture on the cloths rack on the roof of the refugee camp, Maram won the third prize. With the 200 dollars, she is going to buy her own camera. We then all went to celebrate and enjoy the amazing nightlife in Ramallah. 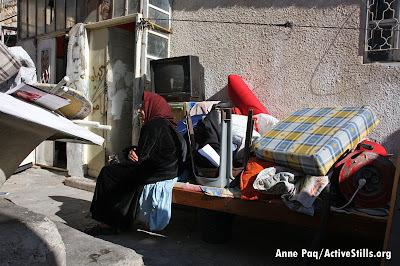 For Maram, it was even the first time she was going to Ramallah. The evening was magical and full with laughs. That result is a great encouragement for the whole group. We will continue to participate into other photo competitions and we are now preparing a photo exhibition for the end of October. For more information and to see more of their pictures, please visit our website: www.imagesforlifeonline.com. By Gideon LevyMahmoud Abbas has to stay home. As things stand right now, he must not go to Washington. Even his meetings with Ehud Olmert are gradually turning into a disgrace and have become a humiliation for his people. Nothing good will come of them. It has become impossible to bear the spectacle of the Palestinian leader's jolly visits in Jerusalem, bussing the cheek of the wife of the very prime minister who is meanwhile threatening to blockade a million and a half of his people, condemning them to darkness and hunger. If Abu Mazen were a genuine national leader instead of a petty retailer, he would refuse to participate in the summit and any other meetings until the blockade of Gaza is lifted. If he were a man of truly historic stature he would add that no conference can be held without Ismail Haniyeh, another crucial Palestinian representative. And if Israel really wanted peace, not only an "agreement of principles" with a puppet-leader that will lead nowhere, it should respect Abbas' demand. Israel should aspire for Abu Mazen to be considered a leader in the eyes of his people, not only a marionette whose strings are pulled by Israel and the United States, or affected by other short-term power plays. Right now power rests with the powerless Abu Mazen. Since Washington - and perhaps Jerusalem as well - badly want the photo-op otherwise known as a "peace summit" to show off an "achievement," Abu Mazen could and should threaten to boycott the meeting to try and force some achievement on behalf of his people. Palestinians live in Gaza, too - an area controlled by Hamas, which Abu Mazen so loathes: He cannot continue to ignore the inhumane conditions in which Gazans live, caged in by Israel. But the impression Abu Mazen makes is that he's no more than a political survivor. He's participating in the American-Israeli masked ball not because of naivete or weakness - for him, Gaza is just as "hostile territory" as Israel is. Therefore, he shares a shameful common interest with Israel, which will do neither side any good. Judging by his behavior Abu Mazen not only doesn't object to what Israel is doing in Gaza, he may even agree with the twisted doctrine arguing that cruel pressure will subdue Hamas and return the people to Fatah's embrace. In so doing, Abu Mazen proves that he's no "downy chick," as Ariel Sharon once put it, but a cynical rooster who cares little for the welfare of his people. A genuine peace conference should involve all the hawks. Peace is forged between bitter enemies. The question of whether Saudi Arabia will take part in the summit or not is futile unless it includes real Palestinian representation. At most Abu Mazen represents only half of his people and could achieve, at best, half an agreement that wouldn't survive anyhow, given Hamas' strong opposition. It is in the interests of all the parties involved, including Abu Mazen, to drag Hamas to the negotiation table. A peace conference without Hamas and without Syria is a joke. But the short-sighted coalition of the royal triumvirate, Jerusalem-Washington-Ramallah, is trying to promote a false vision of "peace talks" without the decisive partners, while the world is busy applauding this illusion. Obviously, it is hard to expect from Abu Mazen that he will rise above his narrow interests and call for an invitation to be issued to Hamas, the party that was democratically elected to lead the Palestinian government. But the least one could expect from the person with the lofty title of "President of the Palestinian Authority" is to strive for the greater good of all his people, especially in light of the extent of their distress. But instead of acting to bring about a cessation of hostilities and opening Gaza to the world, the triumvirate is busy formulating yet another position paper that won't be worth the paper it's written on and that will soon find itself in the garbage bin of history, along with its predecessors. It will only serve to impose increasingly cruel hardships on the people of Gaza. Abu Mazen must not participate in this farce. Mahmoud Abbas devrait rester chez lui. Les conditions actuelles devraient lui interdire de se rendre à Washington. Ses rencontres avec Ehoud Olmert tournent graduellement à l’humiliation pour son peuple : rien de bon n’en sortira. Le spectacle des visites amicales du dirigeant palestinien à Jérusalem est devenu insupportable à la conscience, avec ce déluge de baisers sur la joue de l’épouse d’un Premier ministre qui menace, dans le même temps, d’imposer le blocus à un million et demi de personnes appartenant à son peuple, de les plonger dans le noir et de les affamer. Si Abou Mazen était un vrai leader national, et pas un petit revendeur, il devrait annoncer qu’il n’y aura ni conférence ni rencontres tant que le blocus de Gaza ne sera pas levé. S’il était doté d’une stature historique, il ajouterait qu’il n’y aura de conférence que si Ismaïl Haniyeh en est. Lui aussi représente les Palestiniens. Et si Israël voulait vraiment la paix et pas simplement, avec un dirigeant fantoche, un « accord de principes » ne menant à rien, il s’empresserait de respecter cette exigence. Israël devrait lui aussi être intéressé à ce qu’Abou Mazen soit considéré par son peuple comme un dirigeant et non comme une marionnette à fils actionnée par Israël et les Etats-Unis ou par des considérations de pouvoir à court terme. Le faible Abou Mazen dispose maintenant de pouvoir. A un moment où Washington et peut-être Jérusalem aspirent tellement à ce prétexte à photos baptisé « Conférence pour la paix » afin de pouvoir présenter un « résultat » quelconque, il pourrait et devrait faire peser la menace d’un boycott de sa part pour essayer d’obtenir au moins quelque chose pour son peuple. Dans Gaza maintenant aux mains du Hamas qu’il exècre, vivent aussi des Palestiniens et Abou Mazen ne peut pas continuer d’ignorer la situation inhumaine dans laquelle ceux-ci vivent, emprisonnés par Israël. Mais Abou Mazen donne l’impression de n’être rien de plus qu’un survivant politique. Ce n’est ni naïveté ni faiblesse s’il prête la main au bal masqué américano-israélien : Gaza est maintenant pour lui, non moins que pour Israël, un « territoire hostile ». Entre Israël et lui existe par conséquent une unité d’intérêts honteuse et qui ne sera utile à aucun des deux camps. A en juger par son comportement, non seulement Abou Mazen ne s’oppose pas à ce qu’Israël fait subir à Gaza, mais peut-être même s’associe-t-il à la doctrine aberrante selon laquelle ces pressions brutales amèneront la capitulation du Hamas et le retour des habitants dans le giron du Fatah. En fait, Abou Mazen démontre par là qu’il n’est pas un poulet-qui-n’a-pas-encore-ses-plumes, comme l’appelait Ariel Sharon, mais un coq cynique pour qui le bien de son peuple est le cadet des soucis. Un véritable sommet pour la paix devrait réunir toutes les parties au conflit. La paix se fait entre ennemis acharnés. La question décisive n’est pas de savoir si oui ou non l’Arabie Saoudite y participera - c’est sans importance - mais si pourra s’y rendre une véritable représentation palestinienne. Abou Mazen représente tout au plus la moitié de son peuple et il peut aboutir, dans le meilleur des cas, à un demi-accord qui ne pourra pas tenir l’eau face à une puissante opposition du Hamas. Il est dans l’intérêt de toutes les parties, y compris celui d’Abou Mazen, d’amener le Hamas à la table des discussions. Un sommet pour la paix, sans le Hamas et sans la Syrie, n’est qu’une vaste blague. Mais la coalition myope du trio artificiel, Jérusalem-Washington-Ramallah, tente de présenter la vision fallacieuse de « discussions sur la paix » sans la participation des partenaires décisifs, et le monde applaudit à cette mystification. Il semble difficile d’attendre d’Abou Mazen qu’il s’élève au-dessus de ses considérations étroites et demande qu’on invite le Hamas, qui a été élu, faut-il le rappeler, pour diriger le gouvernement palestinien lors d’élections démocratiques. Mais le minimum qu’on puisse exiger de celui qui porte le glorieux titre de « Président de l’Autorité Palestinienne », serait qu’il essaie de se préoccuper de tous ceux qui appartiennent à son peuple, en particulier quand ils sont plongés dans une détresse aussi terrible. Cependant, au lieu d’œuvrer à un cessez-le-feu et à l’ouverture de Gaza au monde, on s’occupe en ce moment de la formulation d’un nouveau document - qui ne vaudra pas le papier sur lequel il sera signé et sera aussitôt expédié dans la poubelle de l’Histoire comme ceux qui l’auront précédé - ainsi que de nouvelles mesures brutales à imposer aux habitants de Gaza. Il n’est pas permis à Abou Mazen de participer à cette farce qui déferle sur nous depuis Washington. ( c) Anne Paq/Activestills.org, Jerusalem Friday 21 September 2007. (c) Anne Paq/Activestills.org, Bethlehem, Friday 21 September 2007. Ce vendredi, comme le vendredi precedent, les Musulmans de la Cisjordanie n'ont pu se rendre a Jerusalem pour aller prier a Al-Aqsa. A Bethlehem, les quelques soldats israeliens ont repousse avec desinvolture les Palestiniens, essentiellement des femmes et personnes agees, qui pensaient avoir leur chance. Mais ce week end coincidait avec une fete juive, ce qui a provoque bien evidemment un bouclage complet des territoires. Un des soldat que j ai interroge m'a dit de chercher les raisons du bouclage sur internet..un peu court comme explication, je cherche sur l'internet et je ne vois rien qui peut justifier de telles mesures de punitions collectives. Si on veut punir tout un peuple parce que des individus ont tue des civils, alors Tel aviv doit etre aussi bloucle. .je lui ai aussi demande de reflechir a ce que les Palestiniens allaient penser en rentrant chez eux. est ce que cela va vraiment aider a garantir la securite d'Israel? That Friday, as the previous one and certainly the next one, the Muslims from the West Bank (and of course all from Gaza!) could not go to Al-Aqsa Mosque in Jerusalem. In Bethlehem, a few Israeli soldiers pushed carelessly away the crowd, essentially women and old people who thought they might have a chance. But this week end was also Jewish holidays, which entailed of course total closure on Palestinian territories. One Israeli soldier to whom I asked how he could explain the fact that they prevented all these people to go to Jerusalem just to pray told me to look at the internet....a little short as an explanation. well i am looking and i cannot see anything to justify such a treatment. if we are talking about punishing a people because some individuals killed civilians then Tel aviv should be under closure too. I asked this soldier what he would think the Palestinians would think after another day of humiliation. was it really getting to help Israeli security? Palestinian medical sources reported on Thursday midday that one Palestinian boy was crushed and killed by an Israeli military bulldozer near Al-Buraij refugee camp in central Gaza strip. Dr. Moaiwyah Hassanain, the director of the emergency department at Health Ministry in Gaza identified the boy as Mahmoud Qasassy, 17. Eyewitnesses reported seeing the boy run over by the bulldozer and crushed to death as he stood near some trees. Witnesses added that another civilian was injured and lay in the fields where medics and ambulances were unable to reach him. The Israeli army shot and wounded at least two Palestinian residents in the al-Buraij refugee camp. Medical sources said that they were shot by Israeli warplanes which had earlier supported the army's invasion of the area. Witnesses said that a column of Israeli tanks, supported by warplanes, invaded the eastern part of the refugee camp on Thursday night, firing heavily on homes in the area. Meanwhile, an Israeli special-unit force infiltrated Shuka village, to the east of Rafah city, kidnapping at least 20 residents. Today's events come one day after the Israeli government declared the Gaza Strip 'an enemy entity', and announced that it is considering cutting power and fuel supplies to the region. At midday on Thursday, Palestinian resistance fighters of the Qassam brigades, the armed wing of Hamas, said that they fired 11 home-made mortar shells at the invading troops. The Israeli army has not made any reports of injuries to its soldiers.